A new spider season. As summer starts, the webs are getting bigger, and there are lots of them. 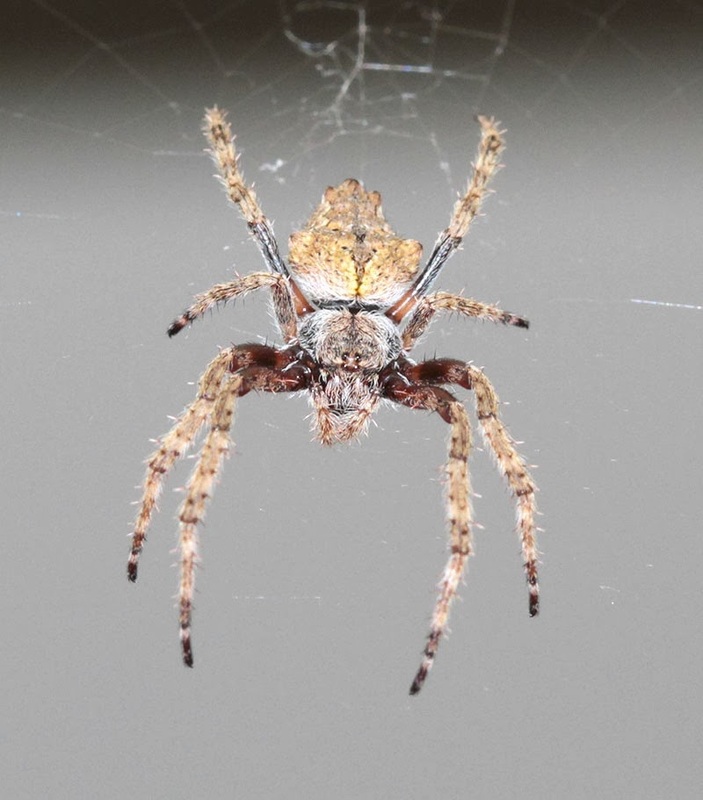 Last season there were few orb weavers around. After a wet winter this year, there are plenty. 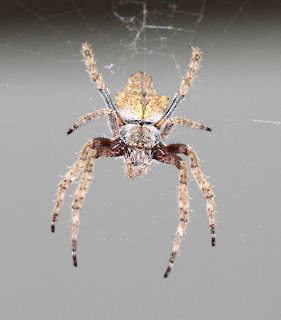 Three of the orb weavers I am checking every night are three different species. 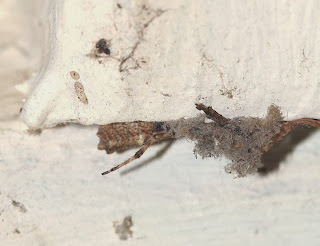 I have become extremely fond of the little spider in this blog, who I've watched grow from a speck to near her full size, a body length of about 10 mm. Intelligentsia is a clever little spider. 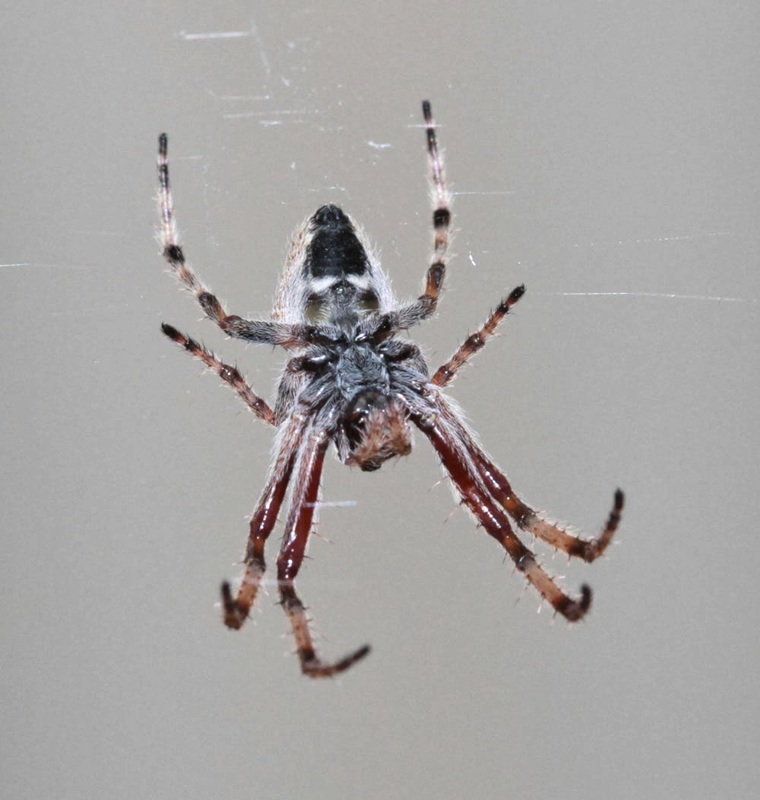 She built her web across the door into my Garret, the studio where I write. I have 'trained' orb weavers before - moved the main structural lines which were in the wrong place a few times, and the spider seems to get the idea. I did the same with Intelligentsia. For a month or so now, she has built her web with a curved 'doorway' for me just high enough to go in and out with ease. Unfortunately, husband Damian forgot to duck last week and ruined Intelligentsia's web. Fortunately, as he bumbled into her real estate during the day, she was safely tucked away in her retreat. 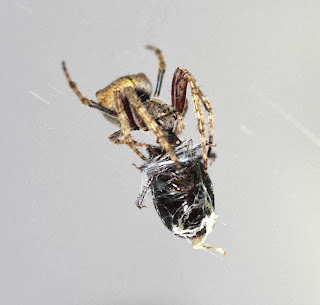 Intelligentsia has the bumps on her abdomen, front and rear, typical of her species, Eriophora pustulosa. Her underside has the black patch which also distinguishes the species. This is the view I get as I leave the Garret. Intelligentsia comes out each night, repairs her web (or rebuilds it if some silly man has forgotten to duck). She lives the usual active life of a spider, including catching, killing and and devouring insects. During the day, Intelligentsia retreats to a patch of old web from a long-gone cobweb spider in a gap in the verandah roof. One leg is always in touch with her orb web, just in case dinner arrives early. I'll introduce the other two orb weavers in the next blog. And keep you informed on Intelligentsia's life. Hi there! I'm just checking the blog again, and I just catch a updated! I like the friendly way of your writing, and pictures. 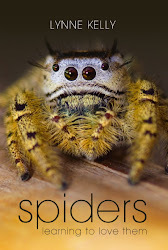 I enjoy reading about those spider's stories. Thank you for sharing. Thank you or writing! You have made my day! I hope to be blogging about once a week as the summer goes on. I hope that you stay in touch! Delighted that you like them. More coming soon! Sad news, though. We've had a really hot summer with extreme heat waves, and Intelligentsia was close to a tin roof. She came out during the day to move away from the intense heat, but just didn't make it. I really miss her. Only one of my orb weavers has survived the heat - she lives in the shadow of the house within a dense ivy pelargonium. I see her every night but can't find her during the day. I'll blog her soon. Hello! I have experienced the same with my little orb weavers. I had one form a Web over my dryer but took in consideration of me needing to use the washer, pull the dryer lint trap, and turn the knob. I was so impressed that I moved my arachnid phobia aside and allow it to stay. And I have one who lives on the front porch, same species, who too took in consideration of me and formed an archway that clears my head perfectly. I'm not as scared of spiders as I use to be. What a fantastic story. It was getting to know individuals that cured me of my fear of spiders, too. I have had an orb weaver weave her web with an arch at the right height for me to pass through, but people don't believe me when I tell them. I am so glad to hear it has happened to someone else. Love to hear any more of your stories. Thank you for writing!